Family-owned Classic Tool & Die has positioned itself as a one-stop shop. At its 30,000-plus-sq.-ft. operation in Oldcastle, Ontario, Canada, the midsized company designs, builds and tries out stamping dies on a stable of presses in capacities to 1500 tons, primarily for the automotive industry. With Classic employing 3D Systems’ Cimatron, an integrated package for die quoting, designing and manufacturing, the one-stop shop has a one-stop shop for tool creation, according to Oppio, noting that his company has been a Cimatron user since the early 2000s. Today, Classic uses the Cimatron 2D and 3D cutting packages as well as its full die design product. In producing complex tooling primarily for automotive customers, as depicted in this screenshot of a lower die, Classic Tool & Die employs Cimatron all the way through the process. The integrated software package provides for die quoting, design and manufacture. To add to efficiency, Classic has developed a proprietary interface on its CNC machines, building workstations into each machine that enable simplified transfer and recall of job files as well as easier setup and operation, Oppio reports, noting that innovation doesn’t end there. In an era where talented and experienced die designers and machinists prove difficult to find, Oppio reasons that automating processes with the help of the design and build software allows Classic’s designers and machinists to not only avoid time-wasting, error-prone tasks, but better focus on performing their jobs in the most effective and efficient ways. On a project basis, Classic employs Cimatron from the initial stage of accepting a customer tool file by importing it into a Cimatron station. 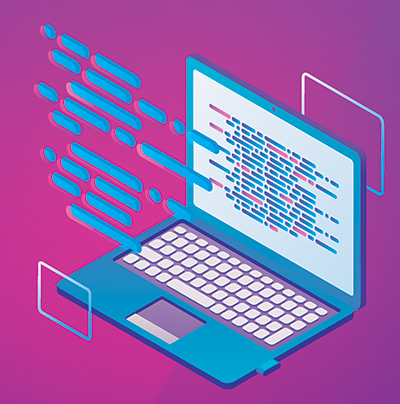 Then, at another station, the company’s quoting team views the file and decides how to produce the tool or determine the process for designing and building. 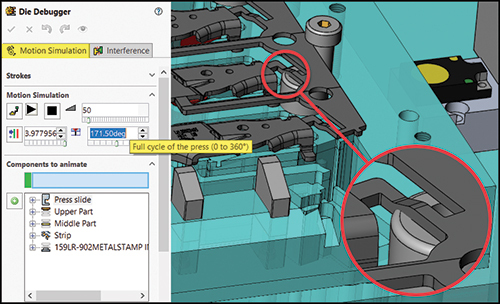 From there, Classic may employ the package’s strip layout function, and then undertake complete die design followed by transfer to the CAM process. Catalog features represent another software plus for Classic, as the company has developed its own catalogs over the years, and employing them within Cimatron adds much efficiency to die design, Oppio reports. “Overall, we like the ease of use and simplicity of the software, but it also offers a lot of features and options for advanced users,” he says. With its processes in place, backed by an experienced team using an all-in-one design and build package, Classic can meet the demanding lead times required in the automotive industry, offers Oppio—even when the tooling project features the most advanced materials. No stranger to tougher steels, Classic was an early tester of third-generation advanced high-strength steels, working closely with Ford on third-generation R&D, and also dealt with TRIP steels when they first appeared. While building tools for such materials requires the skills and expertise of Classic’s engineers, on the CAM side, Cimatron accommodates the unique and challenging techniques required for machining. A separate research project in partnership with Ford, independent of tooling work, also showcased the effectiveness of Cimatron packages. As high-strength steel increased its presence in automotive applications during the early 2000s, Centerline Engineering sought better ways to assess the tough and tricky material’s formability. That led to the company’s initial purchase of eta/Dynaform forming-simulation software from Engineering Technology Associates, Inc. (ETA) in 2003, and it’s been employing the software ever since. Comstock Park, MI-based Centerline Engineering, formed in 2000 and now counting about 100 employees, designs, builds, tries out and repairs progressive, transfer and line dies for automotive and appliance stampers. To do that, it fills 68,000 sq. ft. of manufacturing space with eight tryout presses, including a new 2500-ton large-bed press from Eagle Press; CNC five-axis, vertical and horizontal mills; wire EDMs; and more. Keeping that machinery running productively, and keeping customers happy with on-time delivery of tooling that produces quality parts, begins with inhouse engineering expertise backed by design solutions such as Dynaform, according to Travis McCall, a Centerline simulation engineer. 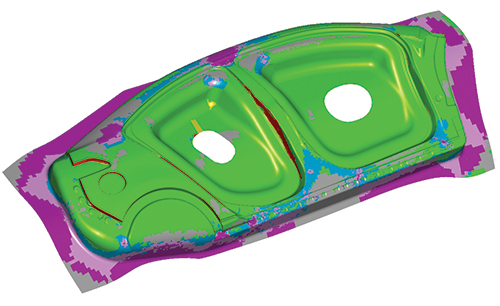 Centerline Engineering employs Dynaform forming-simulation software to assess formability and more, starting early on during the quoting process. Accuracy in its simulation software prevents costly rework and other problems during die build and tryout, according to company officials. Currently using Dynaform Version 5.9.4, the company is set to employ the latest package, Version 6.0, featuring a streamlined interface and optimized algorithms. 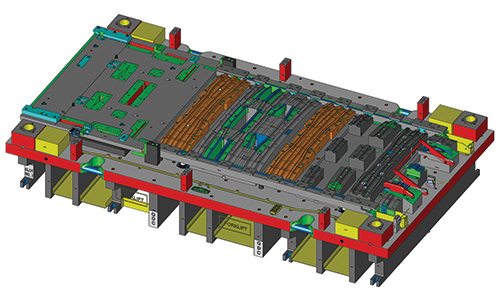 Modules include Blank Size Engineering for estimating blank size and nesting as well as predicting predict thinning and thickening, and generating a forming-limit diagram; Formability Simulation for rapid development and validation of single-station and progressive-die designs; Die Evaluation to support and analyze CAD-based tooling and engineering designs; Die System Analysis to predict stamping-related concerns within the die production line, as well as analyze scrap removal, die structural integrity and sheet metal handling; Optimization Platform to optimize design; and more. Today, with five seats of Dynaform, Centerline uses the software “right from the get-go,” according to McCall, starting with quoting and continuing through the design process. The software also checks the formability of drawn parts based on bead locations and pad pressure—another big plus, according to McCall. And, blank development in Dynaform represents one more advantage for Centerline. Report generation represents one more advantage to employing Dynaform, automatic generation of simulation reports, coming in Version 6.0, makes McCall and Centerline even bigger fans. The Dynaform software ties in handily with the 17 seats of Catia 3D CAD design software employed by Centerline, reports McCall, who also notes that ETA responds immediately to assistance requests and with training and other support. With the software’s many capabilities, backed by the support network Centerline performs the above-mentioned actions successfully no matter the type of material slated for production in the dies, reports McCall. “We build dies for some pretty big parts and a variety of part materials,” he says. “This includes dual-layer material, and the software handles it. For example, we work with dimpled aluminum—two layers of aluminum with insulation between. Simulation involving dimpled aluminum is difficult and takes a bit longer, but when we physically try out the die, the parts look exactly like the simulations. Accurate cost estimating and job tracking are critical in running a successful and profitable business. Estimating too high delivers fewer jobs, while estimating too low shrinks profits. And, losing track of an invoice, or forgetting to invoice a customer, affects the bottom line. The key to success: Get it right every time. In 2016, Tombigbee Tooling, Inc. (TTI), Manatachie, MS, while searching for a job-tracking and quoting solution to turn quoting into a seamless, time-saving and accurate process, turned to TSTracker and Estimator ERP software from TST Tooling Software, LLC. Selling TTI’s owners, DeWayne and Debbie Thornton, on the software was its ability to provide the consistency and accuracy necessary to optimize profitability. Established 30 years ago as Smith Tool & Die Co., TTI started out machining fixtures, stamping dies and more for local industries. Today, in an expanded 22,000-sq.-ft. operation, the company and its 43 employees across two shifts routinely design and manufacture progressive, manual-transfer and automated-transfer dies. In incorporating new software, the Thorntons required of it three things: 1. Guarantee the flow of work through the shop with minimal disruption to the current process; 2. Allow managers to oversee everything at the touch of a button; and 3. Quote jobs accurately. TST Tooling Software provided this video of customer testimonials. TTI previously employed a web-based, generic job-tracking and management system, but that didn’t fit into the company’s desire for a customizable system that could serve as a platform to handle future management efforts, improvements and expansions. Because TTI benefits from using VISI software to build tools, the company also would benefit by employing TSTracker. That’s because TST Tooling Software Technology, developer of TSTracker, also sells and supports VISI CAD/CAM in the United States. In addition, TSTracker and Estimator has the ability to communicate with VISI, thus providing an integrated solution for estimating and design. Today, with the software in place, TTI seamlessly tracks jobs from start to finish. Using Estimator, the company can quote all aspects of a die build, from materials and components to labor. Within TSTracker resides a full database history of TTI quotes and jobs that can be referenced easily when generating future quotes. Bills of materials (BOMs) from all jobs can be imported from any CAD system, which can be used to create RFQs and purchase orders for materials and components. Vendor purchase orders can even be exported to QuickBooks. As to implementation, TST performed onsite installation of TSTracker and Estimator and associated training, a process that only took three days, according to TTI officials. And, TST showed TTI departments how to use the system to its advantage. Accounting learned how to export reports from TSTracker to QuickBooks. CAD designers learned how to import BOMs easily from VISI, and TTI’s quoting department reportedly picked up the ins and outs of TSTracker in only a couple of hours. Typically, everyone in the company can learn and perform the various processes within a few days, according to TST officials, with TST’s support line available to address issues and answer questions. Beyond only tool design and build, the administration, tracking and paperwork comprise other key functions of a job shop. The multi-user TSTracker ERP software provides for complete histories, inspection tracking, employee accountability, password control, production status and more at a glance. Metalstamp, Inc., Minooka, IL, specializes in stamping lead frames for the automotive industry, but recently also has begun stamping HSLA brackets for sunroofs and for other automotive applications. The company employs 20 presses and features four servo-driven presses, one of those a new 330-ton Aida press used to stamp the new brackets. Metalstamp designs 40 to 50 new dies each year, including about 20 progressive dies, with trim dies as the balance. As sales have grown, the company manages to keep the number of toolroom personnel constant. A big part of accomplishing this: moving most of the die tryout and debug operations from the tryout press out on the plant floor to the computer screen in the office. This ability fits perfectly with Metalstamp’s progressive nature and willingness to keep up with technology. Die Debugger’s Motion Simulation tab in Logopress3 allows the user to see the die running in a virtual press (including the strip lifting and advancing), and motion can be paused at any point in the 360-deg. press cycle. After a dozen years using a 2D die design add-on for AutoCAD, Metalstamp purchased SolidWorks-based Logopress3 in 2011. At that time, Ben Hutchinson, currently Metalstamp operations manager, and a colleague worked as die designers. Months later, Joel Martin began performing die design at the company and completed his first design using only SolidWorks. “I realized after that first die design that something was missing.” says Martin. A short time later, Metalstamp added another Logopress3 seat for Martin. In using Logopress3, Martin appreciates all of the standard catalog components included in the software, and the amount of work done automatically when adding the components. The software not only adds a component, but also creates a hole pattern when requested, cuts all the holes for the component, adds the correct ordering information to the bill of materials and adds attributes to all of the holes that will appear when a hole table is inserted in the 2D detail drawing—all automatically. The Logopress3 Interference list tab shows each interference found as the die is running. In this case, the selected interference is the stretch web portion of the skeleton/carrier colliding with the pilot lifter as the strip is feeding. Designing with 2D CAD was speedy partly due to users not needing to create nearly as much information as when using 3D parametric design, according to Ray Proeber, president of Accurate Die Design Software, noting that running the die in a virtual press on the computer screen using Logopress3 requires 3D die design data. “I’m not sure if the designs have gotten much faster, but for sure they are much more complete,” says Hutchison. More complete designs flow more quickly through the shop, and, of course, design cost represents only a fraction of build cost, according to Proeber. Metalstamp has employed Logopress3 for virtual tryout on the computer screen for several years. “Several of our dies have fit together without one problem, and parts come out nearly perfectly the first time in the press,” says Martin. Among the new Logopress3 enhancements enjoyed by Martin: the tryout portion of the software, renamed as Die Debugger, along with online how-to videos and live online screen-sharing meetings included in the technical support for the product. Most of the setup for Die Debugger is not performed at the end of the design, but takes place on an as-needed basis during creation of individual die stations. When using 2D CAD software, or even 3D die design software without a tool such as the Die Debugger feature, Martin notes that the motion of the die’s various stations must be accounted for one way or another during design of the die in order to understand the travels of the various components.